I just realized that I did not post my visits to the gynae at week 20 and 24. And in a blink of an eye, I am now 30 weeks++ pregnant dee. By 24 weeks, his face is almost fully formed - complete with a full set of eyeleashes and eyebrows and a good sprinkling of hair on his head. 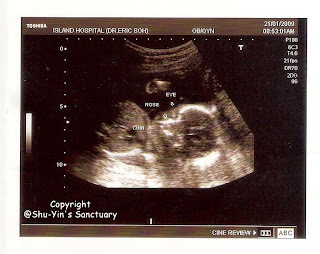 Actually, little angel's head is still snow white in colour, since there is no pigment in that hair just yet at 24 weeks. Little Angel is getting bigger by the day - also getting bigger is his brain, which is preparing for life outside the womb, and for a lifetime of learning. This is where I am now..into my 30th week of pregnancy. However, at the last scan which was 2 weeks ago, Dr. Eric said my Little Angel is growing on par with my pregnancy calendar except for his head which is 4 weeks bigger! But rest assured, Dr. Eric said this is normal as sometimes the head grows faster than the body. At the next few scans, the body may continue to grow while the head growing may slows down. We won't know 'til the very end of the pregnancy. 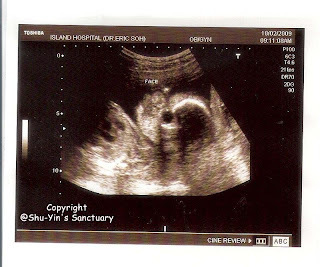 but the ultrasound monitor is way clearer than these printouts. 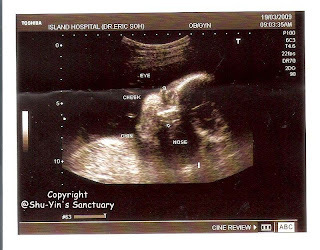 You know, u can tell the face shape of your baby thru the ultrasound pics? If you think your little angel has your hubby's face shape then prolly the little boy will come out with your hubby's face shape.. its true!!!! emily..but i dont really know how to see who my little boy looks like. im bad at pin-poining facial features. swei...yalor. so fast 7 mths dee. now im getting nervous dee about labour. omg shu yin!!! this is so damn weird. becky...haha. u didnt know? I am surprised! Coz i even posted my pregnancy pics in facebook! Didnt know u didnt know!